Right-handed hurler Luke Leftwich has had a successful campaign in 2017 that has seen the youngster change roles from a starter to a reliever. Following an April in which he posted a 5.84 ERA in seven appearances with the Class A Advanced Clearwater Threshers, the 23-year-old has tallied a 2.20 ERA in 33 games since then. Additionally, Leftwich sports an overall 10.8 K/9 mark, has notched eight saves and leads Florida State League relievers in innings pitched with 73 2/3. Last year as a starter with Class A Lakewood and Clearwater, Leftwich posted a 10-7 combined record with a 3.38 ERA in 23 games. The six-foot-three 205-pounder was the Phillies' 7th round draft selection in 2015. I recently talked with Luke about his success this year, his switch to the bullpen, his approach in the new role, facing Tim Tebow and plenty more. Read ahead for that full interview. -You've enjoyed success this year. Share some thoughts with me, if you can, about your satisfaction with your season, going from starting to relief down there with the Threshers this year. It started out a little unsatisfactory for me. I have pretty high expectations for myself and to start out kind of slow like that it was a little frustrating, but I worked a lot with Aaron Fultz, our pitching coach, and focused on mentality and pitch calling and over the course of the year it started turning around. And now, looking back through on the season, I'm pretty content with how the season went. -You talk about Fultzy there and I imagine advice from a guy that's had to go through a lot to reach the big leagues and then having success there can help you a lot. Are there any lessons from his career that he's shared that have helped you? Yeah, it's actually been wonderful working with him because he's a guy that had to spend a long time in the minor leagues to end up having a really long major league career and then everybody's goal is to pitch in the big leagues. That's why we're here. That's why we're doing this. It's been good to hear his point of view on trying to stay level through the ups and downs of minor league baseball because the end result of being in the big leagues is worth the ride. So, I've tried to just-- I've been trying to take in everything he's given me. -I just wanted to ask you about the conversion, from starting to relief, because I'll talk to coaches, and they'll say sometimes when that switch is made, maybe a guy wasn't mastering a third and fourth pitch, so they want to see how he might get by with just the two key offerings. What was the case for you? How was the switch brought to you? They let me know at the end of spring training that they were going to be switching me and they made a point to tell me that it wasn't because they thought I wasn't good enough to be a starter. They just kind of thought the way I pitch played better as a reliever and they wanted to try that out and pretty much told me right at the beginning of the year, they said this might not be a permanent switch, we just want to see how you project as a reliever. And after they watched me a bit, my velocity took a jump and my pitches and aggressiveness all developed well and they told me this is where they like me. And I like relieving now and it's definitely been a fun change of pace and I think I've gotten better out of it. -What was the velocity jump for you? Where were you before and where does the fastball reside right now? Last year I kind of sat low 90's, anywhere 90, 93. Touched a few 94's every now and then. And this year, I've been mostly sitting 94, 95, 96. And hitting 97 every now and then. -How about the repertoire. Any changes to the pitch repertoire with the role change? No, I kind of kept it the same. (I've changed) more when I'm throwing pitches, rather than what pitches I'm throwing because as a starter, you've got to mix a little bit more because you see people maybe three or four times through the order. (As a reliever) you may only see them once. So, you kind of just attack with your best and don't leave anything in the tank. -What is the go-to pitch and what offerings do you have? It is fastball, slider, curve ball, change up and I like to stick-- it depends on the day, between I always pitch with my fastball, that's the kind of pitcher I am, and then whatever secondary off-speed pitch is the best that day is kind of what I roll with and that's why I keep all three off-speed pitches because there's a pretty heavy chance that one, if not two, will be on that day. -Looking at your stat line your strike out rate is outstanding and there's a nice strike out to walk ratio as well. If I go to the team stat page and I rank guys by strike outs, you're among the team leaders, which is outstanding for a reliever. And you've got a lot of innings thrown out of the bullpen. What do you attribute all of that to? For me, it's all about being aggressive. It's about attacking hitters and trying to get them out of the box in three, four pitches and if you're not going to put the ball in play, then I'm going to strike you out, so, that's kind of my mentality out there on the mound. As far as which pitches I throw (to do it), I'm big on reading swings and after the first two pitches of an at bat, I can usually tell which pitch to go to for the strike out after that and attack. -What other feedback have you gotten outside of the tips from Fultz or stuff about how they wanted to see you play out in the bullpen? Nothing in particular. It's all been positive from the coordinators and coaches. Everybody keeps saying, "Keep doing what you're doing." Just trying to keep up the positive streak right now. 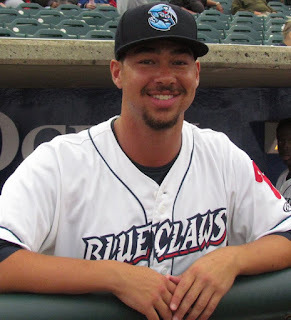 -There's been a lot of turnover with the roster there this year and a guy added to the roster during the season is Aaron Brown, a guy that's going from playing the outfield to pitching. Is he a student at all among the guys in the bullpen? He pitched a lot in college and he had a really successful college career. I wouldn't necessarily call him a student with us. We were joking about it the other day about how he's slowly turning into a pitcher, as far as the goofiness and that kind of stuff that comes with sitting in the bullpen for nine innings. He's been fun to have around and has been a good addition to our bullpen. It's kind of fun to see him learning how to pitch again and learning how to be a bullpen arm and we've got a good group of guys here to help him out if he needs it. So it's been good. -I know you picked up your first win of the season last week when you guys knocked off St. Lucie. You got to face a guy in that one that's still drawing a lot of attention. What can you share about facing Tim Tebow? Yeah, I came into the game with two outs and Tim Tebow up and it was one of those pretty cool moments because every American that follows football knows who he is and what kind of a person he is. And now him being a minor league baseball player, it was kind of fun to step on the mound against him. We had great crowds and it was kind of funny because I got him to hit a routine ground ball to shortstop and the crowd reacted like he just hit a walk-off in the World Series. So, it's fun to have environments like that. -Labor Day and the end of the season are coming fast. Do you have plans in place for the off-season? I'm gonna graduate from college in December, so that's kind of exciting for me. Yeah, but as far as baseball goes, I just want to kind of stick to what I've done the last couple years because I feel like I've taken positive jumps in each off-season, which is hit the weight room pretty hard, stick to our conditioning program and really spend a lot of time perfecting the art, which is pitching. -Now that you mention it, I remember when we talked last off-season, you mentioned that you made the pledge to your mom to make sure you graduated, right? Yeah, she's an assistant principle at an elementary school and she's big on education, obviously. And when my dad went through the same process when he was drafted he never went back and finished school. So, I told her, and more-or-less she told me that, you're finishing school no matter what. And, so, this December I will have a degree and I'm pretty excited about that. It's been a long time coming. -That is exciting! Congratulations in advance on the degree and congratulations on the season as well.